Who were the real Ninja, what skills did they possess and how were they employed in warfare? Based upon new translations of the three most important ninja scrolls and other authentic documents, some never seen before. 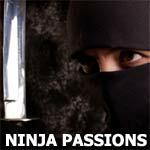 Lost in modern myth, false history, and general misinterpretation, the Ninja have been misrepresented for many years, but recently, a desire for a more historical view of the ninja has become a popular theme in the history/martial arts community. Providing a rare, accurate view of the Ninja, this book is based upon the Historical Ninjutsu Research Team's translations of the major ninja manuals and consists of genuinely new material. Little historical research has been done on the Ninja of Japan. Here for the first time the connection of the famous Hattori family warriors with the Ninja is explained, the Samurai versus Ninja myth is dispelled, and the realities of Ninja skills are analyzed. Such questions are answered as How did a Ninja work underwater when mining castle walls? and How can a bird be used to set fire to the enemy's camp? The book explores newly discovered connections to ancient Chinese manuals, lost skills, and the "hidden: Zen philosophy that the Ninja followed.